Small business owners often believe their companies are immune to cybercrime. After all, why would criminals bother with guppies when they can net a whale, right? Wrong. Hackers are increasingly targeting small businesses, because they typically lack the security monitoring and management capabilities of larger companies. The problem for small business owners is consumer grade security programs aren’t robust enough to protect a business infrastructure, but most smaller companies don’t have the IT resources to manage a business-class solution. Bitdefender aims to bridge that gap with Small Office Security, a cloud-based suite that reduces the expense of IT maintenance and makes it easy for non-IT-professionals to manage and secure company computers. Once you subscribe to Small Office Security ($143.50 per year for up to five seats), you login to a Web-based interface called Control Center. From here, you can manage antimalware on all PCs within your network, “roaming” laptop endpoints, and remote office endpoints. 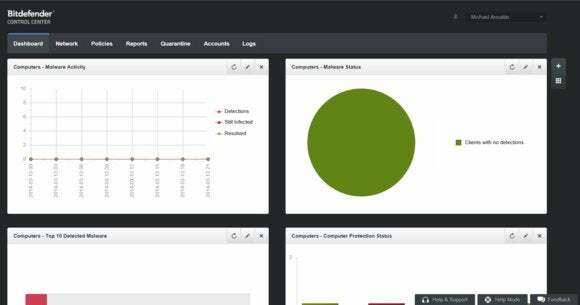 Although the security suite is cloud-based, each protected system receives a local program called Endpoint Security, which can be downloaded manually to each computer or remotely deployed from within the Control Center. The main page of the Control Center features a dashboard that provides a status snapshot of your managed clients. It’s divided into four sections: Malware Activity, Malware Status, Top 10 Detected Malware, and Computer Protection Status. Each section displays a graph or a chart in varying shades of red and green to indicate how your network is faring. For example, the Malware Status section includes a pie chart that illustrates how many systems are infected, fixed, and completely clean. The Top 10 Detected Malware section features a bar graph that can help you identify if certain types of viruses are hitting your servers. In addition to the dashboard, Control Center includes six other tabs from which you can install protection and manage settings, set and apply policies, run reports, remotely manage quarantined files, and check user activity logs. Administrators have full privileges, while employees have access only to network security and user management. Small Office Security isn’t as Windows 8-ready as other suites we’ve seen. The Control Center utilizes non-touch-friendly dropdown menus, and it’s for desktops and laptops only—no mobile protection is offered through the suite. Because small businesses are especially likely to have employees using a variety of devices, including tablets and smartphones, at the office and on company time, it would have been good to see at least a nod to mobile security. For our analysis of Small Office Security’s protection capabilities, we consulted independent data from AV-Test’s December 2013 test results. The security suite received a performance score of 6 (out of 6). This indicates the software is lightweight and easy on system resources, and will run in the background virtually unnoticed. This is especially critical for small businesses, as employee productivity won’t be compromised by sluggish machines, even if you happen to be remotely tinkering around in the Control Center. The suite scored very well in AV-Test’s real-world protection tests, successfully blocking 100 percent of zero-day malware attacks (including Web threats). Although Bitdefender wasn’t included in our 2014 Security Showdown, this score puts it on par with other top security suites, including Kaspersky Internet Security 2014 and Symantec Norton Internet Security 2014 . Bitdefender also performed well on the malware zoo detection test, blocking 99 percent of widespread and prevalent malware discovered in the last four months of 2013. It didn’t flag any safe websites dangerous, and but it did falsely detect legitimate software as malware twice—slightly higher than average—during system scans. Bitdefender Small Office Security is designed for companies with up to 250 seats, making it an attractive choice for small business owners looking to ramp up their network security. It offers great protection and performance with an easy-to-use interface that will keep company endpoints secure with a minimum of hassle.